Does reading about Bedbugs give you bedbugs? Because I have been hell of itchy ever since discovering this blog! Answer: You may not be able to catch bedbugs from reading about them, but you might be spending a bit too much time thinking about them. In the extreme, a person can develop delusional parasitosis, the strong delusional belief that the body is infested with parasites. Apparently, this can consist of the belief alone, but there is a whole host (haha!) of other manifestations wherein people have physical symptoms and haunt the doctor’s office with matchboxes filled with “evidence”. ICK. The conviction of imaginary bedbugs creeping your crannies could also take the form of delusory cleptoparasitosis, which is when you are convinced that your dwelling is infested. These two phenomena cover pretty much every single person I know in New York. However, they are not yet heading to the dermatologist with matchboxes full of cat dander, they are merely scratching at the last of summer’s mosquito bites and doubting, doubting. If you find yourself obsessively eyeballing your mattress seams or magnifying every fleck on your skin, do not consult your doctor, talk to your therapist, meditate, or do whatever it is you enjoy in life that does not include playing the Inspector Clouseau of the bedbug world. Is there a connection between Bedbugs and Hoarders? and wish to assure ourselves that as long as we spring clean and do not let our Lionel Ritchie gatefold collection get out of hand, We Are Not These People. Apartment dwellers who detect bedbugs are always looking for the ground zero of the scourge, a single unit in the building where they expect to find an elderly person cowering behind a wall of newspapers, or a family of illegal immigrants living in squalor. Bedbugs do not have the same prejudices that we do. Blood is blood. Poverty, mental illness and crowded conditions do not attract bedbugs. That is not to say there is no connection between hoarding, extreme poverty and bedbug infestation. Hoarders (and hipsters!) have the unfortunate compulsion to trashpick, which is tantamount to a bedbug importation business. Their deep sense of shame at the way they live (the hoarders that is, hipsters are shameless) will characteristically prevent them from seeking outside help for an infestation. 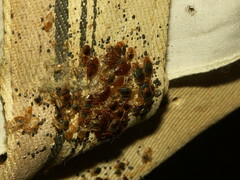 Crowded living conditions can also aid in the spread of bedbugs and make them nearly impossible to treat. And so, we sometimes have instances of extremely vile conditions. But more often this is not the case. Most calls to the exterminator come from very ordinary homes. There might be bedbugs on the bookshelf and the seams of the mattress. Not enough to see, but enough to keep you awake at night watching “Hoarders” on demand. The moral of the story is NEVER dumpster dive, even if and especially if you are crazy. And be sensitive to your neighbors, even if they are insane and unkempt. They may not be the cause of your problems.